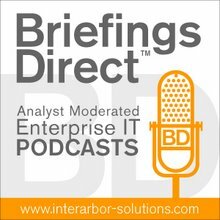 Dana Gardner's BriefingsDirect: Speaking of SOA: Are services nouns or verbs? ZapThink revels in stirring up controversy almost as much as we enjoy clarifying subtle concepts that give architects that rare "aha!" moment as they finally discern the solution to a particularly knotty design problem. Last month's "process isomorphism" ZapFlash, therefore, gave us a particular thrill, because we received kudos from enterprise architects for streamlining the connections between Business Process Management (BPM) and Service-Oriented Architecture (SOA), while at the same time, several industry pundits demurred, disagreeing with our premise that services should correspond one-to-one with tasks or subtasks in a process. Maybe we got it wrong, and inadvertently mislead our following of architects? Or perhaps the pundits were off base, and somehow ZapThink saw clearly a best practice that remained obscure to other experts in the field? Upon further consideration, the true answer lies somewhere in between these extremes. Now, we're not reconsidering the conclusions of the process isomorphism ZapFlash. Rather, further explanation and clarification is warranted. As with any best practice, process isomorphism doesn't apply in every situation, and not every service should correspond to a process task or subtask. That being said, there is also a good chance that some of our esteemed fellow pundits might not be opining from a truly service-oriented perspective, as many of their comments hint at an object-oriented (OO) bias that may be too limiting in the SOA context. In fact, understanding which services the process isomorphism pattern applies to, and how other services support such services goes to the heart of how to think about services from a SOA perspective. In the early days of web services, as various standards committee members tried to hash out how core standards should support the vision of SOA, the SOAP standard for message transport was an acronym for the "Simple Object Access Protocol." The reasoning at the time was that services were interfaces to objects, and hence service operations should correspond to object methods, also known as remote procedures. SOAP was nothing more than a simple, XML-based way of access those methods. Over time, however, people realized that taking this Remote Procedure Call (RPC) approach to service interfaces is too limiting: It leads to tightly coupled, synchronous interactions that constrain the benefits such services could offer. Instead, the industry settled on document style as being the preferred interface style, which expects requests and responses to conform to schemas that are included in the service contracts by reference, where the underlying service logic is responsible for validating interactions against the relevant schemas. Document style interfaces provide greater loose coupling than their RPC-style cousins because many changes to a service need not adversely impact existing service consumers, and furthermore, document style interfaces facilitate asynchronous interactions where a request need not correlate immediately with a response. In fact, the W3C eventually dropped the "Simple Object Access Protocol" definition of SOAP altogether, and now SOAP is just SOAP, instead of being an abbreviation of anything. The answer is straightforward: If a service has no operations, then what it's supposed to do is understood from the context of the service itself. However, document style interfaces still allow for operations, only now they're optional rather than mandatory as is the case with RPC-style interfaces. The fact that operations are optional is a never-ending sense of confusion for students in our Licensed ZapThink Architect course, perhaps because of the object-oriented pattern of thinking many of today's techies follow, often without realizing it. How would you ever know what a service is supposed to do, the reasoning goes, if you don't call an operation on that service? The answer is straightforward: if a service has no operations, then what it's supposed to do is understood from the context of the service itself. For example, an insurance company may want a service that simply approves a pending insurance policy. If we have an approvePolicy Service, the consumer can simply request that service with the policy number of the policy it wants to approve. The insurance policy example brings up a fundamental question. Which is the service, the insurance policy entity or the approve policy task? In other words, should services be nouns or verbs? It's possible to design services either way, as Entity Services, which predictably represent business entities, or as Task Services, that represent specific actions that implement some step in a process, in other words, verbs. Which approach is better? The first statement above instantiates a particular policy, while the second one approves it, and returns either success or failure. Note that we're representing service interactions as input and output messages that contain documents, where in this case, the input documents specify operations. In this example, there is no object in the OO sense representing policy 12345 and maintaining the state information that indicates whether or not that particular policy is approved or not. Instead, the underlying service implementation maintains the state information. There is only the one Policy Service, and it accepts requests in the form of XML documents and returns responses, also in the form of XML documents. If a request calls the create policy operation, then the Policy Service knows to create the policy, while a request that specifies the approve policy operation follows the same pattern. 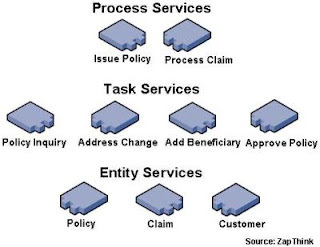 Note that the fact that the Policy Service has a document style interface gives us two advantages: First, we can make certain changes to the service like adding new operations without adversely impacting existing consumers, and second, its stateless nature enables asynchronous interactions, where instead of returning success or failure of the approve request, perhaps, the service returns a simple acknowledgment of the request (or perhaps no response at all), and then notifies the consumer at some point in the future that the policy has been approved, either through a one-way notification event or possibly as a response to a further query. In this example, neither Task Service has any operations, but rather the functionality of each Service is understood from the context of the Service. After all, what would an approvePolicy Service do but approve policies? If you read the process isomorphism ZapFlash, the benefits of delivering capabilities as Task Services is clear. If you design each Task Service to represent tasks or subtasks in business processes, then it's possible to build a service-oriented business application (SOBA) that is isomorphic to the process it implements. A casual reading of the process isomorphism ZapFlash might lead you to think we were suggesting that all services should be Task Services. However, in spite of the fact that architects with OO backgrounds often rely too heavily on Entity Services, such services do play a critical role in most SOA implementations. Remember that in the enterprise context, services expose existing, legacy capabilities and data that are typically scattered across different applications and data stores, limiting the enterprise's agility and leading to high integration maintenance costs, poor data quality, reduced customer value, and other ills all too familiar to anybody working within a large organization's IT department. SOA provides best practices for addressing such issues by abstracting such legacy capabilities in order to support flexible business processes. In the figure above, the bottom row contains Entity Services, which directly abstract underlying legacy capabilities. Above the Entity Services lie the Task Services, which may actually be abstractions of individual operations belonging to underlying Entity Services. The top layer contains Process Services, which are typically compositions of Task Services. In other words, Process Services are interfaces to SOBAs, and when those SOBAs are compositions of properly designed Task Services, they will exhibit process isomorphism. The essential question for the architect is which capabilities to abstract in which service layer. Take for example the Address Change Task Service. Changing addresses is a common example of a particularly challenging task in many large organizations, because address information is typically maintained by different applications and data stores in a haphazard, inconsistent manner. To make matters worse, there may be addresses associated with customers, policies, or other business entities. When architecting the Customer Entity Service, the core design principle is to pull together the various instances of customer-related information and functionality across the as-is legacy environment into a single, consolidated representation. Such a Service will likely have an update address operation, and the Customer Entity Service's logic will encapsulate whatever individual queries and API calls are necessary to properly update customers' addresses across all relevant systems. The Address Change Task Service, then, abstracts the Customer Entity Service's update address operation, as well as whatever other address change operations other Entity Services might have. The Service logic behind this Task Service understands, for example, that insured properties in polices have addresses and customers have addresses, and these addresses are related in a particular way, but are by no means equivalent. As is usually the case, architects have several options at their disposal, and knowing which option is appropriate often depends on the business problem, an example of the "right tool for the job" principle. If the business problem is process-centric, say, a need to streamline or optimize the policy issuance process, then implementing SOBAs as compositions of Task Services will facilitate process flexibility. In other cases, the business problem is more information-centric than process-centric, for example, putting consolidated customer information on a call center rep's screen. In such instances the architect's focus may be on an Entity Service, because the rep is dealing with a particular customer and must be able to interact with that customer in a flexible way. The big picture of the SOA architect's challenge, of course, is delivering agility in the face of heterogeneity. On the one hand, the IT shop contains a patchwork of legacy resources, and on the other hand, the business requires increasingly agile processes. Understanding which capabilities belong in Entity Services and which belong in Task Services is a critical part of the best practice approach to SOA.